The Investment Program of today has evolved from one vitally important decision made in 1995, when the City sold its Edmonton Telephones to Telus Corporation for $465 million. Rather than use that money to pay for specific projects, City Council at the time decided to set up the Ed Tel Endowment Fund. The goal was to use the fund to hold the financial assets generated from the sale and build upon them to help ensure the City’s long-term financial stability. Since 1995, the Investment Program has evolved to become one of the most unique and successful of Edmonton’s city-building activities, managing approximately $2.8 billion worth of assets across seven investment funds. The evolution of the Investment Program can be attributed to some key factors as outlined below. Although each investment fund has its own set of objectives and risk profile, the investment structure achieves economies of scale by pooling various assets together. As a result, the City typically falls within the high value-added and low-cost category in an annual survey of institutional investment managers around the world. 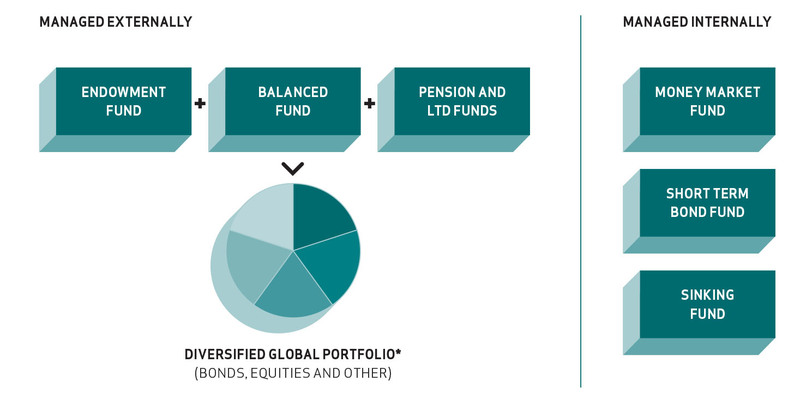 * In addition to the Money Market Fund, Short Term Bond Fund and the Sinking Fund, the internally managed component also includes a portion of the fixed income assets within the diversified global portfolio. The development of internal talent increases capacity to pursue new investment strategies. Additionally, the annual savings from managing a portion of the City’s financial assets in-house are approximately $1.5 million. Different investment strategies offer additional risk control and reduce the possibility of investment losses while also ensuring that fund objectives are met. Governance is extremely important in ensuring proper oversight and assuring taxpayers that existing policies, procedures and controls maximize returns at a prudent level of risk. 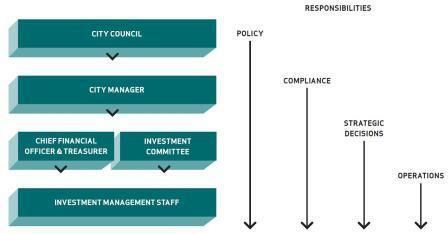 An Investment Committee was established by the City Manager to oversee the City of Edmonton’s investments. Members are selected to bring both investment and business expertise to the Committee. By monitoring the City’s Investment Program and implementing changes as necessary, the committee ensures that the funds are well positioned and appropriately invested to meet their objectives. The continuing advancement of the Investment Program has resulted in sustainable and growing dividends and earnings for the City.